About 800 meters long, with a square area of 185,000 square meters and designed for up to six million passengers a year. 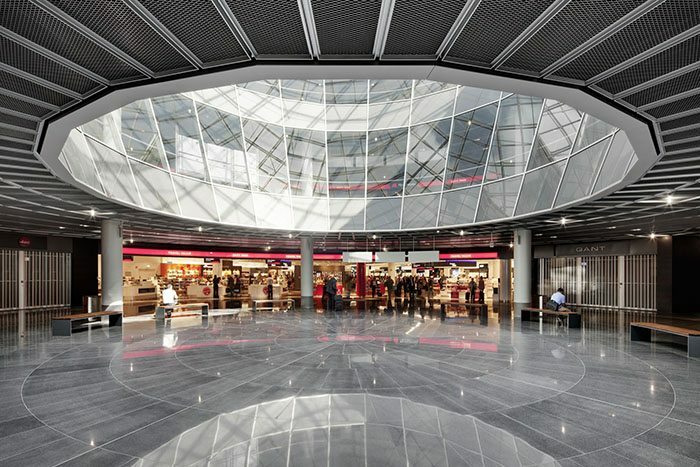 On 10 October 2012, Fraport and Lufthansa started operations in the extension of gate A at Rhein-Main airport, Frankfurt, which has been designed and implemented by the architects von Gerkan, Marg and Partners (gmp). The new A+ gate extends the areas used by Lufthansa at Terminal 1 and was required independently of the extension of the airport extension program, in order to be able to adequately serve the Airbus A380 and Boeing B747-8 wide-body aircraft. gmp’s commission included the new construction of the link between gates A and A+, also called the “root”, the baggage claim area A, the required conversions of existing structures in Terminal 1 as well as the new construction of gate A+. The “root”, the central marketplace with an extensive range of shops, restaurants and lounges, is located at the building interface between Terminal A and gate A+. Its glazed, cone-shaped opening allows daylight to reach the interior, opens the view towards the sky and creates vistas across the different levels of the marketplace. At the same time, passengers are able to see the apron and aeroplanes through a wide opening on the flight side. Individual, specialist retail and gastronomy concepts were tied into an over-arching design principle. Transparency and daylight combined with simple and natural materials generate a pleasant atmosphere. In this way the central marketplace forms a unique architectural space offering a pleasant environment for people to spend time in. Gate A+ extends towards the west following on from the “root”, with a width of about 26 meters and a length of over 600 meters. Owing to new EU safety regulations which state that passengers arriving from non-Schengen states must be separated from departing passengers who have already been security screened, the gate had to be designed with four upper storeys. This means that gate A+ is higher than the existing buildings but nevertheless resonates with the existing design. This was achieved with the help of the design manual, which applies to the entire airport, and which was used by gmp architects to give gate A+ its identity in spite of the existing material specification. Materials such as natural stone, metal and wood were used in similar fashion to Terminal 1, which creates a flowing transition between the existing and new buildings. The further you progress, the more the materials are used in innovative ways; new variations and combinations result in the gate ultimately acquiring its own independent style. The construction grid was optimised to suit commercial considerations, and the large span meant that the designers were able to omit one row of columns which otherwise would have obstructed the space. Ancillary functions such as escape stairs, services ducts and sanitary facilities were located along the northern edge. This has created a completely open space flooded with daylight which provides clarity and easy orientation: passengers have a view of almost the entire length of the gate building, stretching over several hundred metres. This helps passengers with orientation and also makes it easier to gauge the distance to the boarding gate. Here too, passengers have an open view of the apron and aeroplanes. The lighting design supports the differentiation of spaces with architectural means. It is based on the juxtaposition of soft ceiling lighting as background illumination, and distinct functional areas with their own light quality. Light islands and zones for the counter and boarding gate areas, and the retail and gastronomy zones, result in a lively canvas within the large space context and give further support for the orientation of passengers. In the evening, the artificial light flows to the outside through all openings and thus helps to define the architectural shape at night. The ensemble of the façade and roof structure, with its large opening in the “root” area, influences the appearance of the A+ extension at night, from the ground as well as the air. In this way the façade design reflects the large scale, but the detail provides a counter measure to this scale.